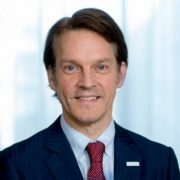 Mathias (老马) is Executive Vice President and Regional Manager Asia Pacific, Energy & Renewables Advisory, at DNV GL – Energy. Mathias and his team of today 150 experts across the region deliver advisory services to the energy value chain including renewables and energy efficiency. His expertise spans onshore and offshore wind and through the work with his team he has good understanding of solar, conventional generation, transmission and distribution, smart grids, sustainable energy use as well as energy markets and regulations.